Lin <林>, a contemporary Asian rooftop bar, is located in the heart of Tiong Bahru Road's Link Hotel overlooking charming pre-war era shophouses. The current heat wave may scare people off outdoor dining but thankfully, the management has installed huge cooler fans for the comfort of the diners. Short for 'Shu-Lin' which means 'forest' in Mandarin, Lin prides itself on giving its drinks an interesting Asian twist by including ingredients such as chili padi, lime infused plums, dragon fruit and Chinese dates. 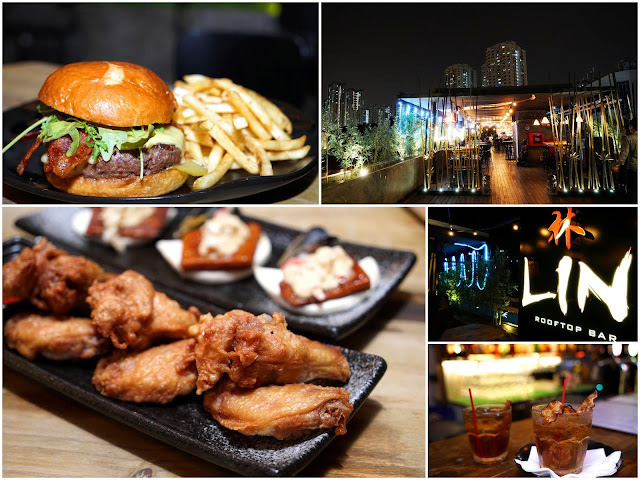 On top of serving a full range of cocktails, wines and beers, Lin rooftop bar also offers a complete menu of tapas and mains, establishing itself as a one stop destination for a date night or to chill out after work. Princess Lotus ($18) is a rather popular cocktail, especially among the ladies, not just because it's pretty. The concoction of vodka, grapefruit syrup, mint syrup, grapefruit, lime wedges and mint leaves made it perfect for this hot hot weather! Cool and refreshing with a nice sour kick! We also tried The Tipsy Pig ($18) combining bourbon and Benedictine DOM with... a strip of bacon strip? and... edamame beans? Interesting selection of ingredients! The inclusion of bacon gives this drink an interesting smokey flavor and the addition of edamame bean helps to cut the sharpness of the alcohol. We were taught from adolescence that drinking on an empty stomach is no good, so... snacking on some tapas is absolutely legit! Lol! Ying Yang ($11.80) of homemade fish otah resting on steam buns with a prawn and mussel coconut sauce was very flavorful and brought back childhood memories of the otah and bread combination. The Empress Har Cheong Wings ($11.80) is marinated with homemade prawn paste batter, and served with homemade chilli by the side. Salty, crispy and addictive. Perfect pairing with an ice cold beer. Lin recently expanded their menu by adding more mains such as Oxtail Stew ($18.80), Rusty Dusty Chick ($17.80), Garlic Butter Mussels ($15.80). We were told that their Chorizo Prawn Aglio Olio ($15.80) is quite popular. The serving for mains are certainly of hearty proportions, as we can see in this Juicy Lucy Beef Burger ($18.80) which features homemade juicy beef patty, melted cheddar cheese, caramelized onions, streaky bacon strips and gherkins. We couldn't stop picking on those addictive fries that came with the burger. Say hi to Babe ($17.80), a gorgeous slab of marinated pork belly with sautéed shitake mustrooms and mixed herb, served with red wine jam and sautéed garlic vegetables! Our first reactions to this dish when served were “Wah! So big portion!” Very nicely executed dish with red wine jam to help balance the fats in the pork. Food is generally on the salty side, which we take to literally mean: drink up more. I can imagine bringing my foreign friends to this charming little bar with a nice view of a very nostalgic estate of Singapore, and soaking up the ambience while enjoying a mix of western food and local delights such as otahs and har cheong kai. Reasonable pricing and generous serving portions adds value to this proposition too. Happy hour starts from 5pm to 8pm for Tuesdays to Sundays, get tipsy on Mondays when it's extended all night long. Ask their friendly staff for promotions of the month! Promotions are valid at published date of this post. Prices stated are in Singapore dollars and subject to 10% service charge & 7% GST unless otherwise stated.